This article is about limousine cars. For the band, see The Limousines. For the former administrative region of France, see Limousin. A limousine (/ˈlɪməziːn/ or /lɪməˈziːn/) is a luxury vehicle driven by a chauffeur with a partition between the driver's compartment and the passenger's compartment. A car with a partition and a greatly lengthened wheelbase is called a "stretch limousine". In some countries, a "limousine service" is a pre-booked hire car with driver, regardless of the type of vehicle. In German-speaking countries, a Limousine is simply a sedan, while a lengthened-wheelbase car is called Stretch-Limousine. The word limousine is derived from the name of the French region Limousin. A particular type of carriage hood or roof physically resembled the raised hood of the cloak worn by the shepherds there. An alternate etymology has the chauffeur wearing a Limousin-style cloak in the open driver's compartment, for protection from the weather. The name was then extended to this particular type of car with a permanent top projecting over the chauffeur. Rich owners of expensive carriages and their passengers were accustomed to their own private compartment leaving their coachman or driver outside in all weathers. When automobiles arrived the same people required a similar arrangement for their chauffeurs. As such, the 1916 definition of limousine by the US Society of Automobile Engineers is "a closed car seating three to five inside, with driver's seat outside". In Great Britain, the limousine de-ville was a version of the limousine town car where the driver's compartment was outside and had no weather protection. (p103) The limousine-landaulet variant (also sold in the United States) had a removable or folding roof section over the rear passenger seat.(p100). In the United States, sub-categories of limousines in 1916 were the berline defined as "a limousine having the driver's seat entirely enclosed", and the brougham, defined as "a limousine with no roof over the driver's seat." The limousine body style has a partition separating the driver from the rear passenger compartment. (p96) This partition includes a usually openable glass section so passengers may see the road. Communication with the driver is possible either by opening the window in the partition or by using an intercom system. Limousines are often long-wheelbase vehicles, in order to provide extra legroom in the passenger compartment. There will usually be occasional or jump seat at the front of the compartment (either forwards-facing, rear-facing or able to face either direction). Stretch limousines are longer than normal limousines, usually in order to accommodate more passengers. Stretch limousines may have seating along the sides of the cabin. A "stretch limousine" was created in Fort Smith, Arkansas, around 1928 by a coach company named Armbruster. Armbruster's cars were primarily used to transport famous "big band" leaders, such as Glenn Miller and Benny Goodman, and their bands and equipment. These early stretch limousines were often called "big band buses". Armbruster called their lengthened cars "extended-wheelbase multi-door auto-coaches". Their 12-passenger people movers were used by hotels, taxis, airlines, corporations and tour companies. A variety of vehicles have been converted into novelty limousines. They are used for weddings, parties and other social occasions. Another style of novelty limousine are those painted in bright colours, such as purple or pink. Vehicles converted into novelty stretch limousines include the East German Trabant, Volkswagen Beetle, Fiat Panda, and Citroën 2CV. There are even instances of Corvettes, Ferraris and Mini Coopers being stretched to accommodate up to 10 passengers. 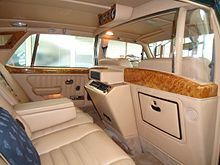 The last production limousine, by Cadillac, with forward-facing jump seats was in 1987 (with their Fleetwood Series 75 model), the last Packard in 1954, and the last Lincoln in 1939, though Lincoln has offered limousines through their dealers as special order vehicles at times. Several Lincoln Premier cars were also built, one being owned by Elvis Presley. Vehicles of this type in private use may contain expensive audio players, televisions, video players, and bars, often with refrigerators. The President of the United States has ridden in a variety of types of limousine stretching back to 1899. In the United States the most popular vehicles for stretch limousines conversion are the Lincoln Town Car, Cadillac XTS, Cadillac Escalade, Chrysler 300, Hummer H2, Ford Excursion, and the Lincoln Navigator. Due to the partition behind the driver, the London black cabs are a type of limousine. The jump seats, also referred to as taxi-tip-seats, usually carry advertising on the underside; the advertisements are visible to the passengers when the tip-seats are not in use. In the U.S., Canada and Australia, "limousine service" (also known as "car service") is the process of pre-booked hire of any car with a driver. The car is usually a luxury car, but not necessarily a limousine. The difference between a limousine service and a taxi service is that limousines are pre-booked and cannot be hired on the spot. Wikimedia Commons has media related to Limousines. ^ a b Dyke, Andrew Lee (1920). Dyke's Automobile and Gasoline Engine Encyclopedia (Twelfth ed.). p. 582. Retrieved 27 June 2015. ^ Ayto, John (2009). Word Origins. A&C Black Publishers. ISBN 978-1-4081-0160-5. Retrieved 27 June 2015. ^ a b c Haajanen, Lennart W. (2003). Illustrated Dictionary of Automobile Body Styles. Jefferson, NC: McFarland. ISBN 0-7864-1276-3. Retrieved 1 January 2019. ^ "Dave's Classic Limousines Pictures: Novelty Limousines". Retrieved 27 June 2015. ^ Pedersen, Stephanie (2004). KISS guide to planning a wedding. DK Publishers. pp. 195–196. ISBN 978-0-7894-9695-9. ^ Naylor, Sharon (2004). 1000 Best Wedding Bargains. Sourcebooks. p. 198. ISBN 978-1-4022-0298-8. Retrieved 27 June 2015. ^ Huffman, John Pearley (19 January 2009). "The Secret Seven: The Top Presidential Limousines of All Time". Popular Mechanics. Retrieved 27 June 2015. This page was last edited on 16 April 2019, at 04:38 (UTC).